Marriage websites, or online matrimonial sites, are a variation of the standard dating websites, with a focus on those wanting marriage rather than simply dating. Matrimonial sites are specially popular in India and among Indians settled overseas. Young men and women in India generally do not feel any compulsion to date since dating has not been a part of the culture historically. India has always been rooted in tradition and religious beliefs. Traditional marriage in India depends heavily on tying partners based on certain important characteristics (religion, caste, class, social status etc.). Arranged marriages and marriages within the family has been the usual norm in Indian families. These Matimony Websites help them find a girl/boy with suitable and desired characteristics. Shaadi.com, one of India’s best known brands and the world’s largest matrimonial service was founded with a simple objective – to help people find happiness. The company pioneered online matrimonials in 1996 and continues to lead the exciting matrimony category after more than a decade. Today, hundreds of thousands of people have met their life partners through our revolutionary matchmaking service and countless others have made some very special friends. By redefining the way people meet for marriage, Shaadi.com has created a world-renowned service that has touched over 20 million people. Jeevansathi.com provides matrimonial classifieds and related services. They provide an information exchange service to prospective brides, grooms and their relatives, in India and in certain other countries. During the Fiscal year 2008-09, 1,932 new profiles of prospective brides and grooms were added per day to the Jeevansathi.com database. As of March 31, 2009, Jeevansathi.com had a database of about 2.9 million such profiles. TimeMatrimony.com is a 100% free Indian Matrimonial website brought up by few dedicated and committed Indian professionals for South Asians all over the world to help them find their life partners without any penny. They are committed to provide you with the premimum and consistence quality experience to find your life partner through the web site. The web site is very simple and you have complete control of finding your life partner through easy to use interfaces and features that can help you identify, filter and contact potential partners. VivahaBandhan.com is India’s premier and most comprehensive matrimonial portal with a touch of tradition and feel of technology. It is one of the fastest growing matrimonial portals dedicated towards building matrimonial alliances and creating successful marriages. This matrimonial site is ideally meant for those who are serious about marriage and are searching for their life partner. This benchmark marriage portal for privileged Indians, with its user-friendly nature enables you to explore, choose and unite with your soul mate in just few easy clicks. Superior and in-depth research technology, understands your needs, helping you find relevant matches better than others. Established in the year 1997, MatrimonialsIndia.com is one of the foremost and vivid Indian Matrimonial Site, providing ample database of thousands of prospective brides and grooms profiles. Due to the sanguine and serviceable approach of its talented and dedicated professionals, MatrimonialsIndia.com has successfully erected a vast list of satisfied clients across the boundaries. Its benchmark is thousands of hits per day which is incessantly increasing day by day and that too at a tremendous rate. The site is mostly known for the perfect matchmakings, handy navigation and commendable services. needs of various communities. CommunityMatrimony is an exclusive matrimony portal catering to the special matrimonial needs of the Community community across the globe. The portal offers several benefits to its members, primary being the pleasure of searching for a life partner within one’s own community from across the globe at the click of a mouse. CommunityMatrimony is powered by innovative tools and cutting-edge technologies to provide the best search experience for its users. EliteMatrimony is a premium matrimony service to help celebrities, aristocrats and the upper crust of society find meaningful and loving relationships that will last a lifetime. 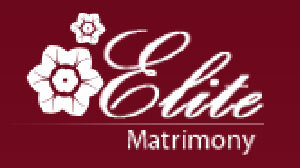 EliteMatrimony.com is an exclusive matrimony website for “the super-rich, celebrities, royalty”. The site offer a differentiated experience for handpicked and select customers through a comprehensive range of premium benefits and personal attention that their lifestyle demands. Other popular Indian Matrimonial Websites are 123-Matrimonials.com, MereSathi.com, iMilap.com, FreeMarriage.com, VivaahaBandhan.com, HamariShaadi.com, MereApne.com, ShubhShagun.com, MarriageExpress.com, PavithraBandhan.com, IndiaBestMatch.com.